Rustler herbicide by FMC provides selective control of annual ryegrass and other grasses and broadleaf weeds in canola and other crops and pastures. Active ingredient: propyzamide 500 g/L SC and propyzamide 900 g/kg WG. 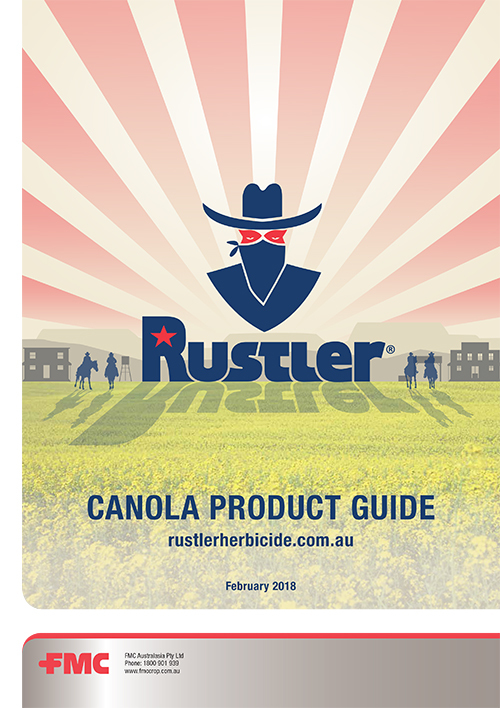 The Rustler Canola Product Guide contains information to help you get the best results from your Rustler application. Download the product guide for easy reference. Rustler requires adequate soil moisture for effective weed control. Rustler is effective in warm moist soils on small germinating grass weeds. Its efficacy improves dramatically when soil temperatures decline below 10°C. Cool moist soils in the months following application will encourage strong residual grass weed control. Adequate and even soil coverage at application is critical for Rustler efficacy. Apply Rustler as a pre-emergent for canola at the label rate of 1L/ha. Water rates should be maintained at a minimum of 70L/ha water, using a coarse droplet. Coarse droplets combined with the minimum recommended water rate will improve soil coverage. Fast sowing speeds can throw treated soil into adjacent furrows where the increased Rustler concentration may lead to crop damage. A slow, steady sowing speed will help keep the Rustler treated soil in the inter-row where it is most effective against germinating weeds. Canola seed should ideally be sown below the applied band of Rustler to avoid reduced plant vigour. Sowing with knife points and press wheels is regarded as the safest sowing configuration when using Rustler. Crop safety when using disc seeding systems is variable based on seed placement. Maximum control is achieved on target weed seeds germinating close to the soil surface. Best results are achieved from minimum or zero tillage systems where weed seeds are close to the surface. High stubble loadings or ash from a recently burnt paddock can lead to poor soil contact. Results may be unsatisfactory if ground cover from stubble exceeds 50%. Standing stubble will cause less efficacy loss compared to stubble that has been dropped to the ground via mechanical means or grazing. It is best to delay application to recently burnt paddocks or windrows until rainfall occurs to disturb the layer of ash. Rustler binds to ash stronger than it does to stubble. Caution – The potential for seedling damage may occur on: i) light soils with low organic matter if heavy rainfall follows sowing, ii) dry sown canola crops treated with Rustler after heavy rain events. Application prior to sowing will minimise risk posed to the following season’s cereal crop. In a failed crop scenario where canola establishment is poor, options for re-sowing with alternative crops are limited. Advice should be sought from an FMC technical specialist in this situation. Summer rainfall can be erratic with the top 10cm of soil experiencing wetting and drying periods. Rustler breakdown over summer will occur when the top 10cm of soil is moist. As the soil dries breakdown will decrease and won’t recommence until sufficient rainfall is received. Rustler is from the Group D herbicide subgroup labelled Benzamides. Rotating herbicide groups is an important herbicide resistance management tool when used as part of a broader integrated weed management strategy. Rotating pre-emergent herbicides ensures that the life of a specific product is extended. Rustler is absorbed by plant roots, preventing cell division (mitosis) of target weeds. Rustler is relatively UV stable, allowing an extended window for incorporation in comparison to trifluralin. Rustler is relatively insoluble (15 mg/L at 25°C). Following application, 80% of Rustler will be present 10mm from the soil surface (under normal field conditions). Best results are achieved when sufficient rainfall occurs soon after application, or soil movement from sowing incorporates the product into the weed root zone. Infiltration could potentially be greater in sandy soils. Rustler requires both adequate soil moisture and warm conditions to breakdown. The half-life of propyzamide significantly increases in soil temperatures below 10°C. Soil pH has no role in the breakdown of Rustler. Soil conditions during spring sowing are often warm with good or variable soil moisture. For optimal control apply Rustler as close as possible to sowing. Application at the recommended rate of Rustler close to sowing will not lead to significant breakdown of the product before it is required for weed control. Coming into winter soils are cooling, the rate of breakdown will be decreasing, and the rate of applied Rustler will be sufficient to control the weed flush at this time. Rustler must make contact with the soil to be effective as a pre-emergent. Application of Rustler prior to weed germination will allow rains to provide sufficient soil moisture for weed root systems to extend into the band of Rustler. Emerging weeds that germinate below this layer may escape control. Rustler activity is directly related to soil temperature and moisture. The effectiveness of Rustler in cool growing conditions is linked to the slow growth rate of the target weeds. Weeds take up Rustler but do not have the metabolic ability to breakdown the active, enabling excellent control in ideal conditions. Physical compatibility with Rustler should be determined prior to mixing with a product not listed in the Rustler Compatibility Sheet, or when mixed as a 3-way tank mix. Failure to follow correct tank mixing orders or compatibility recommendations can lead to poor application and potentially poor weed control. Ensure that any products added to the tank prior to Rustler have completely dispersed. Similarly, ensure Rustler has completely dispersed before adding a product to the tank mix. For correct mixing order refer to FMC’s Tank Mixing Order document. Disclaimer: The information and recommendations in this website are based on tests and data believed to be reliable at the time of publication. Results may vary, as the use and application of the products is beyond our control and may be subject to climatic, geographical or biological variables, and/or developed resistance. Any product referred to in this website must be used strictly as directed, and in accordance with all instructions appearing on the label for that product and in other applicable reference material. So far as it is lawfully able to do so, FMC Australia accepts no liability or responsibility for loss or damage arising from failure to follow such directions and instructions.